Just like the other West African regions i have already discussed, Upper Guinea & Lower Guinea, the Sahel region is often defined in different ways and of course shows overlap with neighbouring regions. Specifically on this page i will focus most of my attention on the countries shown in the map below. 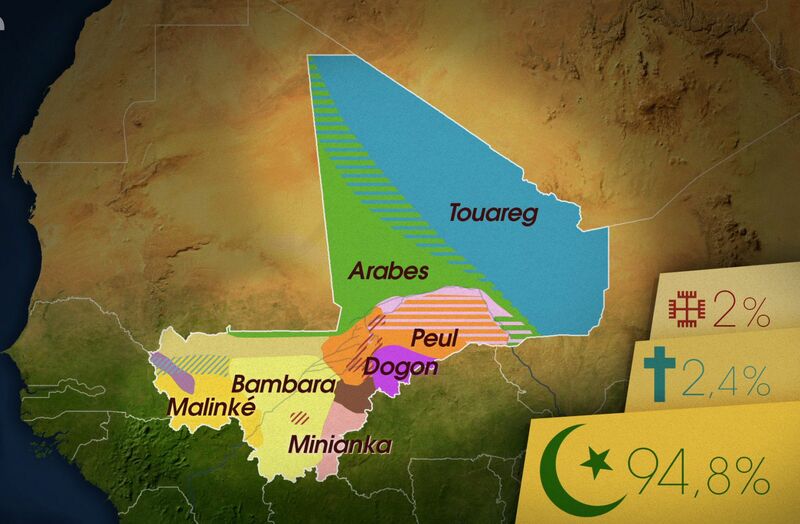 All of them landlocked, except for Mauritania, and therefore perhaps easily skipped when imagining possible places of origin for Afro-descendants. Genetic studies and personal DNA testing might however in some cases still unravel ancestral connections to the people of this region, even when usually to minor degree. Strictly speaking the Sahel zone extends from Cape Verde on the extreme western end of the African continent and Sudan to the east. With Senegambia, Ethiopia and Eritrea often also included. But to the south many coastal West African countries can also be said to belong at least partially to the Sahel region in a broader sense. Especially if you combine the semi-arid grasslands with the socalled Sudanian savanna belt. As shown in the maps below. Throughout the slave trade period the Europeans would also make this distinction between the coastal areas of West Africa – which they were able to visit with their ships – and its more mysterious (to them) interior. 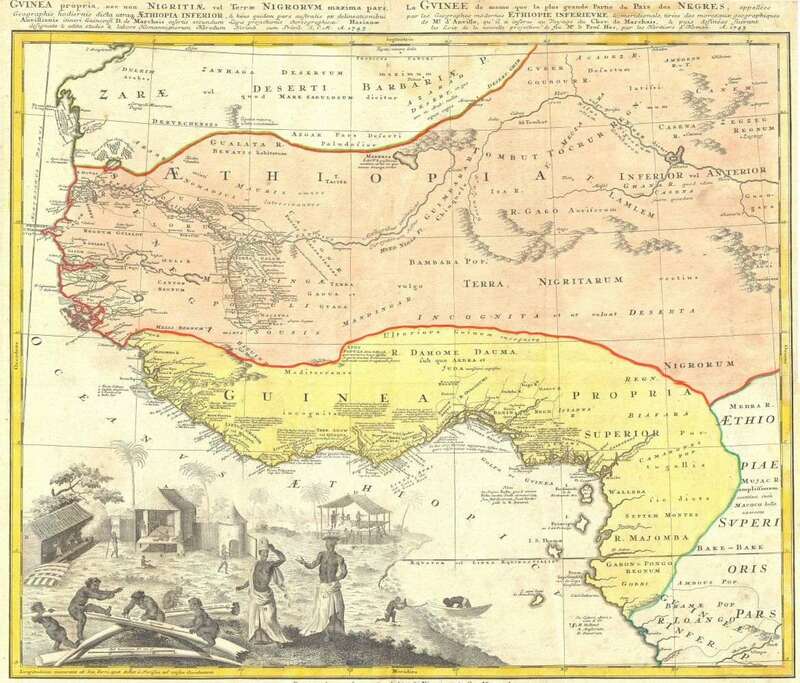 On the historical maps of this era the interior of West Africa is usually demarcated and named differently from the socalled Guinea region. 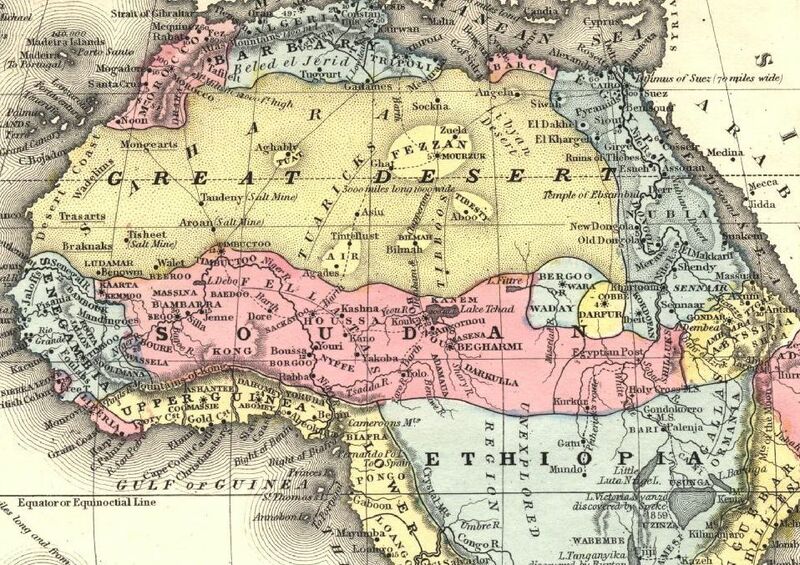 During imperialistic rule by the French in the late 1800’s the Sahel region and surrounding areas were usually referred to as the (western) Soudan. Not to be confused with the modernday country of Sudan but rather originating from the historical term by the Arabs for this entire region (see also this wikipedia article). Ethiopia would often also be located in a rather eccentric way (for us). In the below map dating from 1866 it’s appearing somewhere in Central Africa! Thus it pays to be careful when interpreting geographical names and be aware of their contextdependent meaning 😉 The modernday country of Ethiopia was known as Abyssinia at that time. While actually in some other earlier historical maps (like this one) the interior of West Africa was going by the name of Aethiopia! In this current section i will attempt to avoid any overlap with my previous discussion of Lower & Upper Guinea. 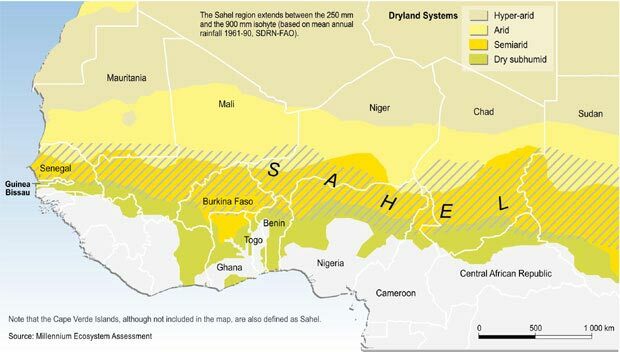 However generally speaking in my other blogposts whenever i refer to the Sahel or to “Sahelian West Africa” i will tend to have a more loosly defined region in mind. Based not only on the strict climatic/vegetation patterns of the socalled Sahellian zone but also on its regional history and cultural aspects which can also be found in the adjacent Sudanian zone. 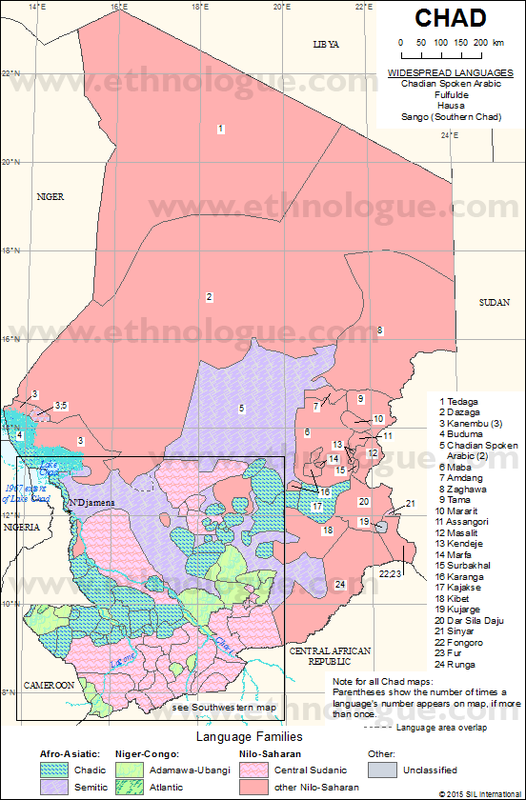 I will be posting historical and ethnolinguistical maps as well as trying to provide some relevant background information about this perhaps more properly said Sudano/Sahel region, a.k.a. the interior of West Africa. In any discussion about the embarkation regions used in the Trans Atlantic Slave Trade the vast hinterland of slave ports should not be forgotten as potential places of origin! Many historians nowadays assume that proportionally speaking the coastal areas of Western Africa, (up to 200 miles inland or so) might indeed have been the most important sources of slaves to be sold in the Americas because of cheaper and easier logistics mainly. Long distance slave trade between the Sahel region and North Africa actually predates any European involvement since the late 1400’s. And the socalled Trans Saharan Slave Trade continued to be the destination of a greater majority of captives within this area throughout the 1500’s up to the 1800’s and even in the 1900’s. Sadly slavery is said to still exist to some degree in Mauritania and also other countries of the Sahel. 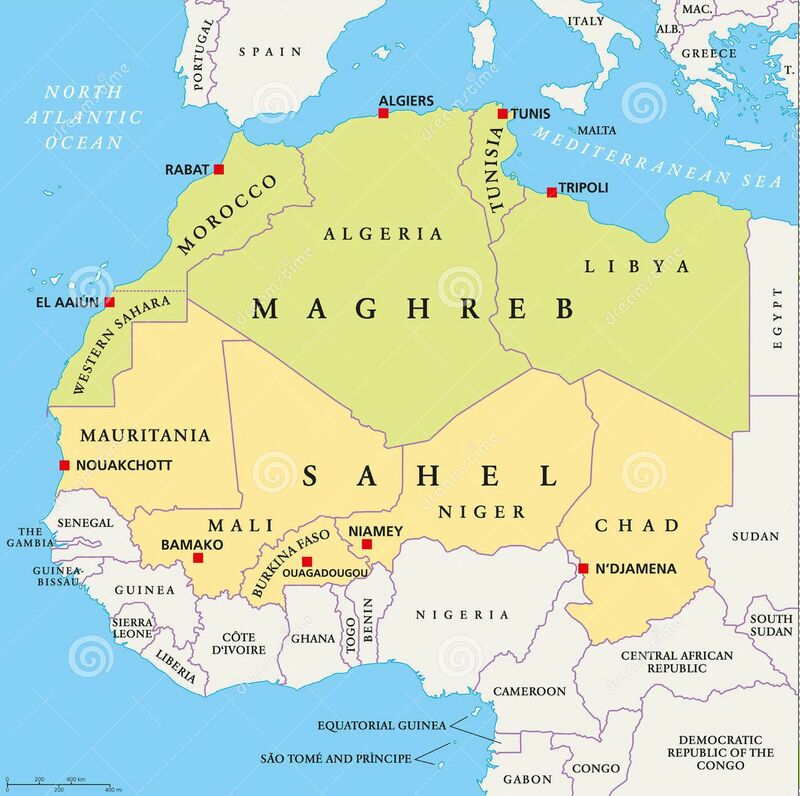 These maps below show how the Sahel countries are situated directly to the south of North Africa, a.k.a. the Maghreb and also the historical connection between them. 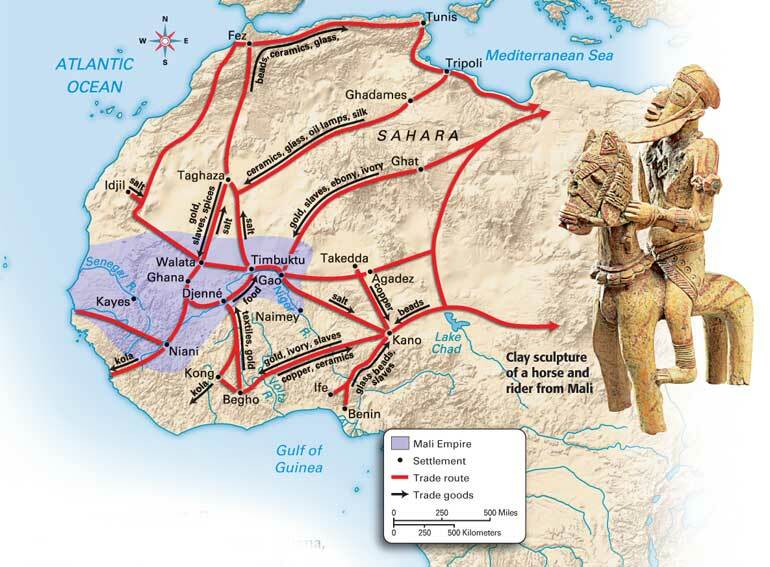 Despite the vastness of the Sahara desert, trading connections, cross-cultural influences and even population movements (in both directions) have been occurring for many centuries between these two regions. Even with these Trans-Saharan connections being more significant, it is still sufficiently documented that captives from far inland would also regularly end up in the Trans Atlantic Slave Trade. Often after a gruesome march towards the coast in socalled slave caravans. Probably more so towards the ending of Trans Atlantic Slave Trade in the early 1800’s because of ever increasing European demand for slave labour and escalating warfare throughout West Africa’s interior. But actually already in earlier timeperiods (1600’s/1700’s) it’s historically known that numerous captives with origins from within the Sahel would be taken to the coastal slaveports at times. Some slave ports would have had much more inland reaching connections with the interior than others. 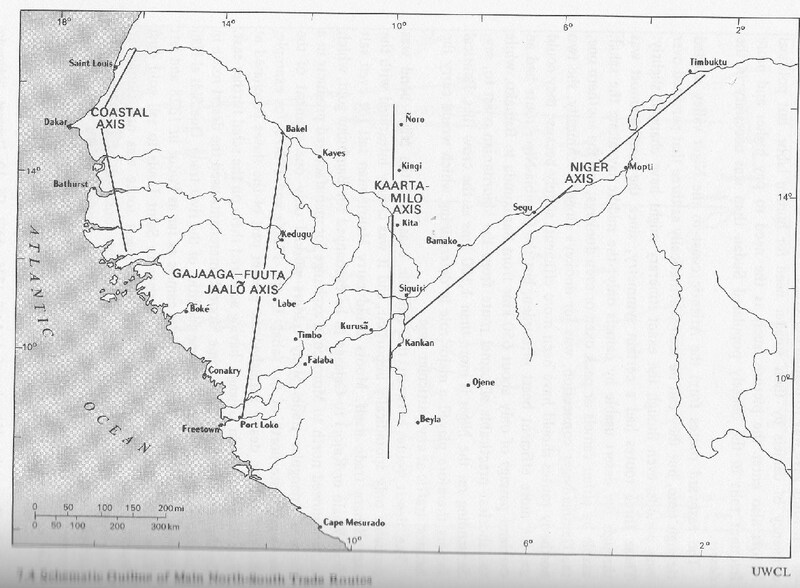 For example a thriving and diversified trade (not just slaves) between Upper Guinea and its direct hinterland, reaching deep into Mali, had historically always existed. Even before the arrival of the Europeans. 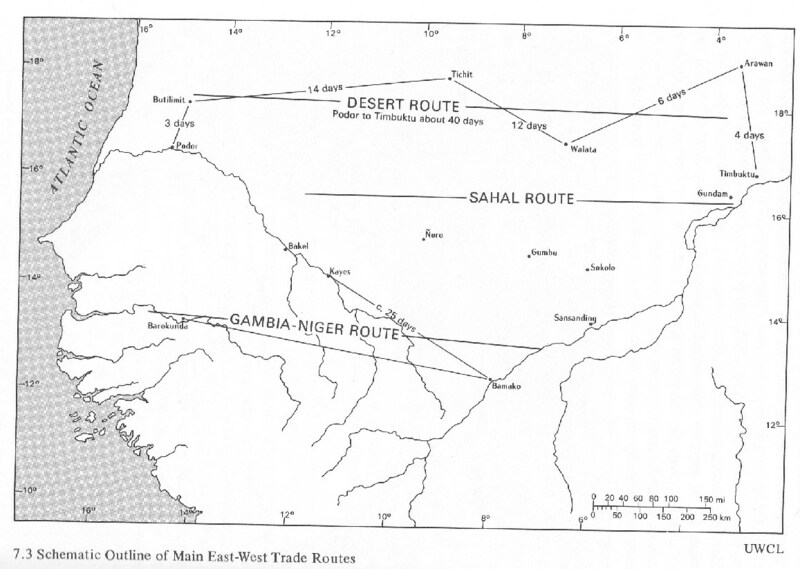 These strong links were facilitated by the possibility of transport along the Niger, the Gambia and the Senegal rivers. Other coastal areas might traditionally have been more isolated from further inland. Especially the heavily forested Wind Ward Coast and perhaps also the Bight of Biafra. The Gold Coast and the Bight of Benin taking a middle position possibly. 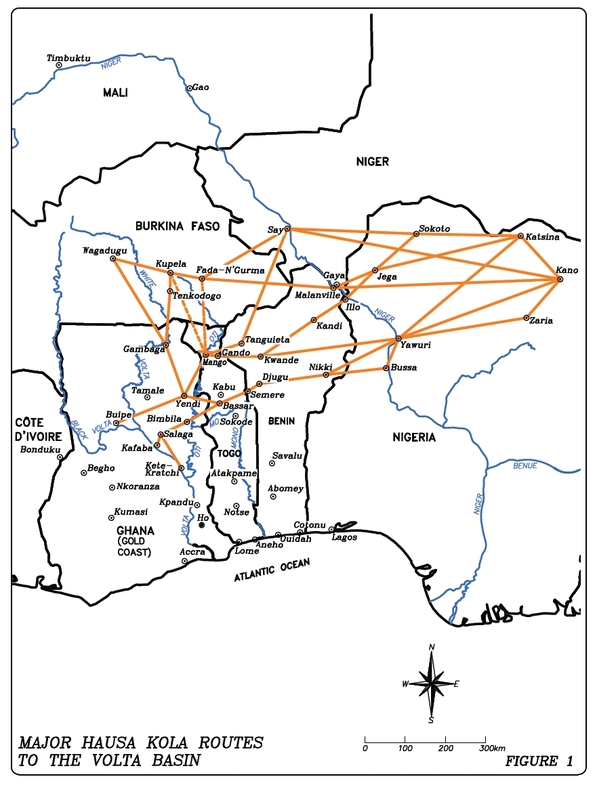 The slave caravans departing from West Africa’s interior were flexible and adjusting their final destinations according to profit and risk considerations. It is therefore known that captives from the same ethnic groups were sometimes sold to European traders located in slaveports far removed from one another, or even in entirely different embarkation regions. Something which might be obscured when you rely exclusively on slave trade statistics. For example an enslaved Mande speaker would usually have left for the Americas via a slaveport somewhere in Senegambia, but very regularly also via Sierra Leone/Guinea Conakry and much less frequently but still at times even via the Gold Coast! 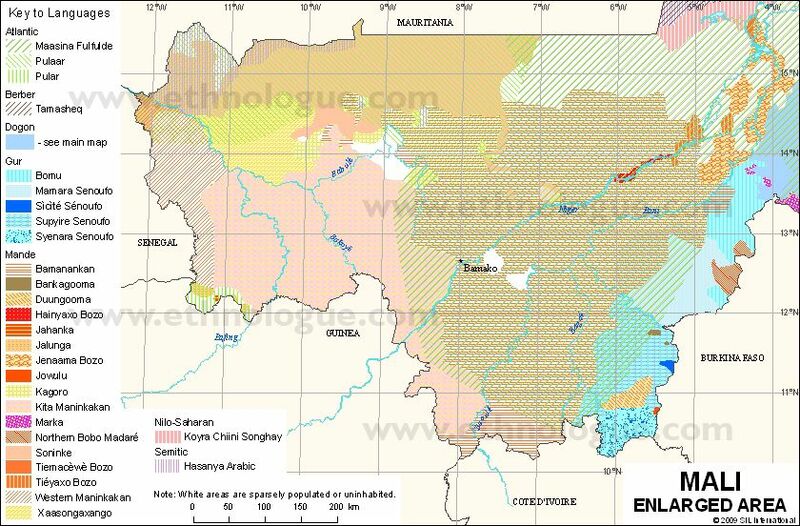 culturally the socalled Sudanic empires of Mali, Songhay etc. (see maps below) deeply influenced various people throughout the region and also beyond. 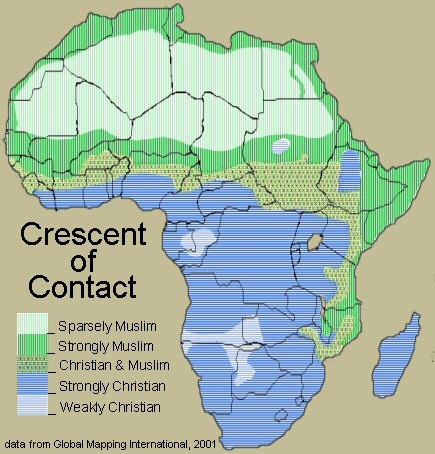 religionwise the Sahel can be said to be predominantly Muslim in contrast to the coastal areas of West Africa where Christianity and traditional African beliefs are more prevalent (exception being Upper Guinea). Despite an early presence in the Sahel region Islamization was very gradual though and many people held on to their traditional beliefs at first. a large degree of economic integration because of widespread networks maintained by long distance traders and their crossregional diasporas. 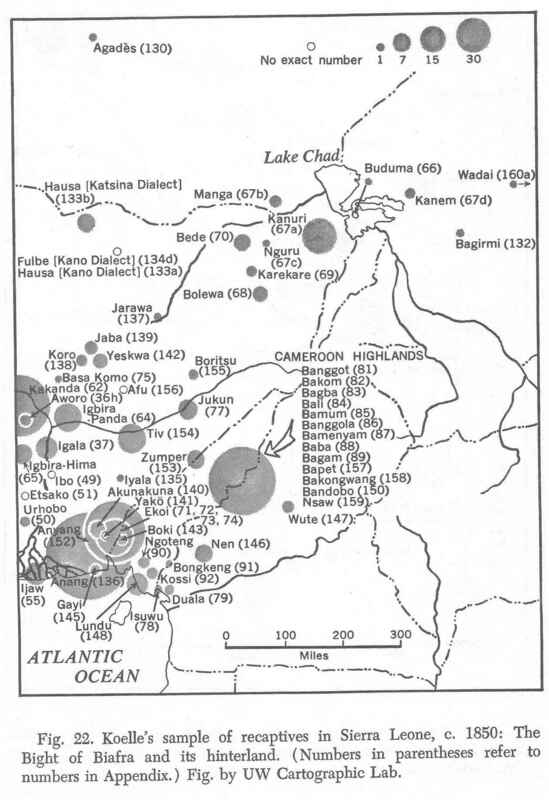 largescale geographical dispersion of a few ethnic groups, notably the Mande speakers, the Fula and the Hausa throughout the region. However many other ethnic groups also being strictly localized and more unique to each single country. Below maps are meant to illustrate some of these commonalities. The last maps shown from the 1700’s/1800’s would be most relevant when tracing your African roots to this area. The earlier ones however help to explain some of the basic historical dynamics and population migrations of the Sahel region. For other (more crude) maps see also this link. Keep in mind that during the Slave Trade Era the distribution of religions would have been different, especially for Christianity. Islam had an early presence in the Sahel but adherents of traditional beliefs often resisted conversion till the late 1800’s. And even when nominally Muslim or Christian many of these beliefs might still be retained in syncretic forms. Naturally most people will tend to focus on the cruel transport of enslaved human beings along these routes. However long distance traders were also involved in the commercialization of a wide array of regional products, often helping to boost local economies. 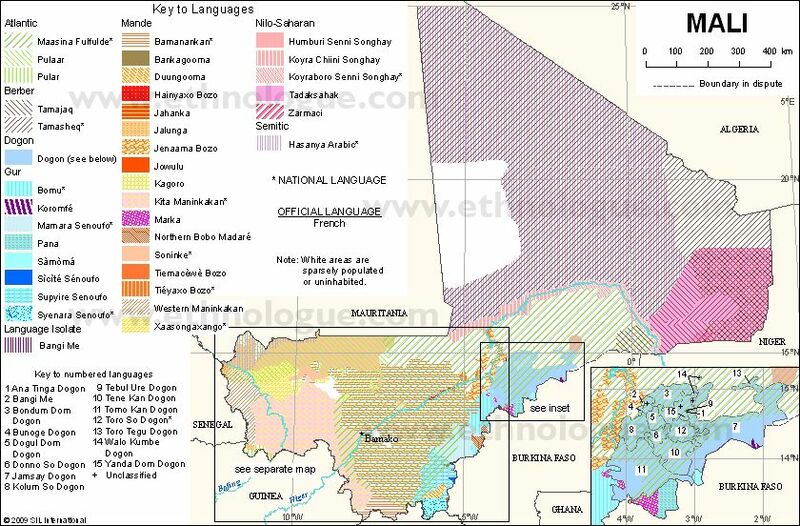 As can be seen from these maps below the main languages of the Sahel region have a greater geographical distribution than the ones along the coast (although unlike what’s shown these languages aren’t always spoken by the majority in each often multilingual area). 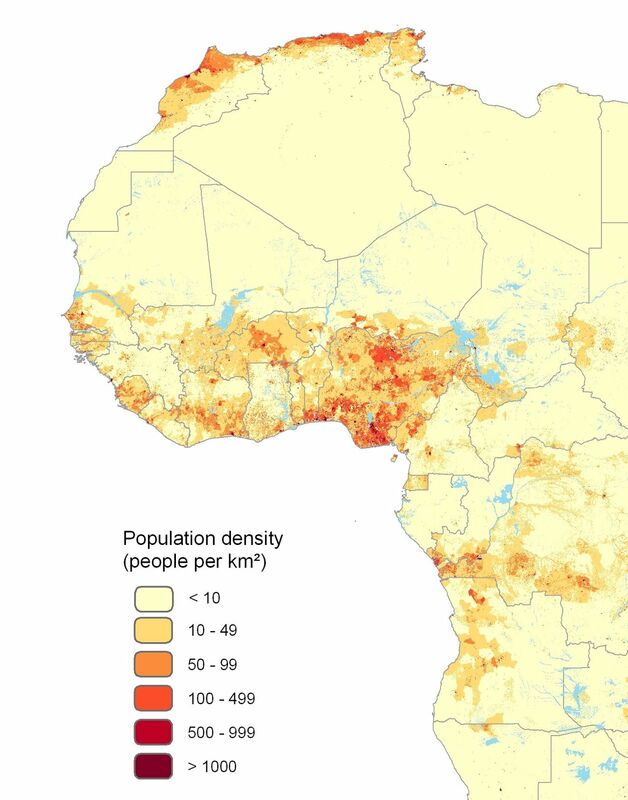 This is partially because of a lower population density but probably also because of a greater historical integration and mobility in West Africa’s interior. The Fula, a.k.a. Fulani/Fulbe/Peul, perhaps typify this pattern the best as they can be found from their original homeland in Senegambia/Mauretania all the way east to Sudan! However also the expansion of Mande speakers and the Hausa has been very impressive and even more so culturally influential among non-native speakers. Due to languageshift and intermarriage with other ethnic groups there might be considerable genetic variation between speakers of the same language. 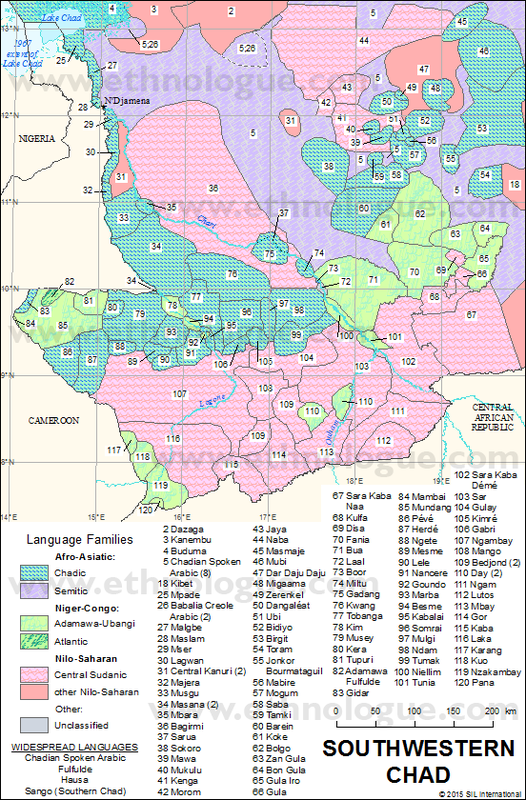 The Pulaar/Fulfulde languages/dialects spoken by the Fula are usually classified as Atlantic/Senegambian and most closely related to the Wolof and Sereer languages, all three likely to have originated along the Senegal river valley. (see wikipedia article). 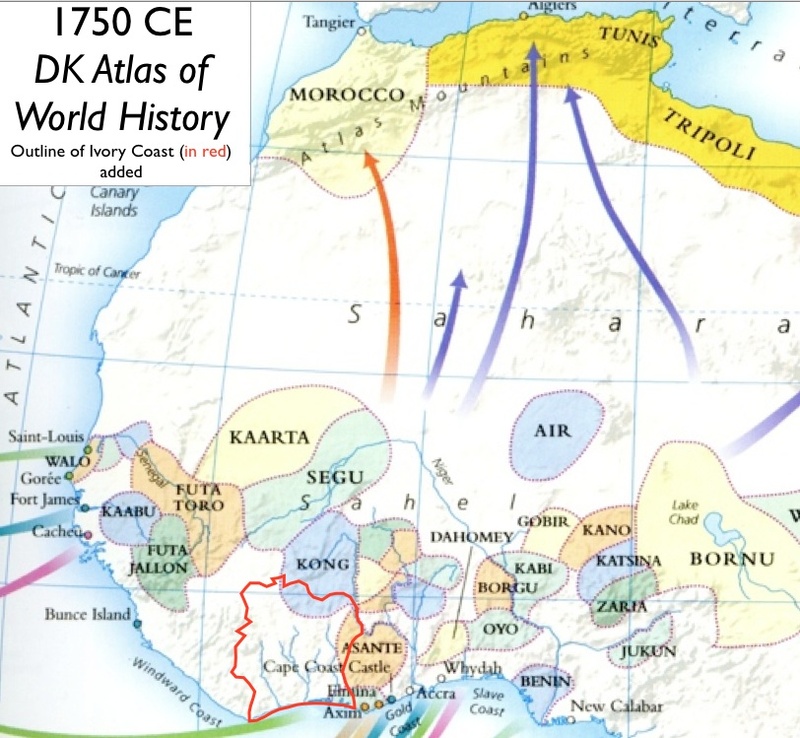 Their genetic profile is quite distinct due to their unique ethnogenesis possibly also involving Berber speaking peoples from the times of the Ghana Empire. But perhaps also reflecting earlier admixture from Proto-Berbers and Nilo-Saharans during any of the Green Sahara periods. For more details see this article. For a very informative website about their various subgroups click on this link. Despite many shared cultural aspects and often being lumped together as “Mandingo”, the Mande speakers are actually not one single ethnic group. 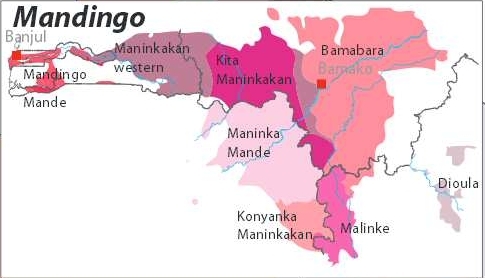 It’s really a language family with the socalled Mandingo/Mandinga from Upper Guinea being only one distinct language/ethnicity among many others, all interrelated but to varying degree. 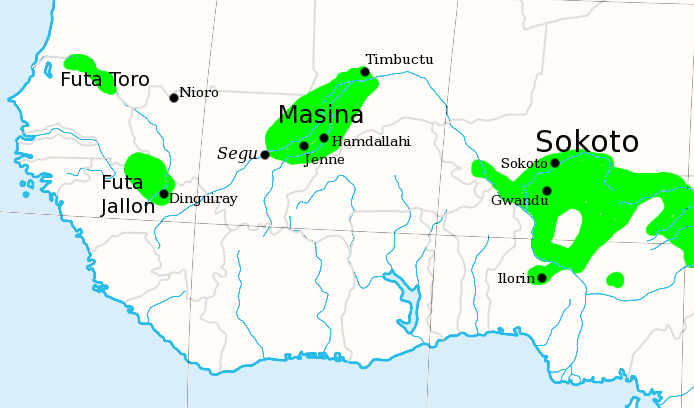 Historically the Mande languages spread from their Mali heartland into neighbouring areas of Upper Guinea as well as northern Ivory Coast and parts of Burkina Faso. 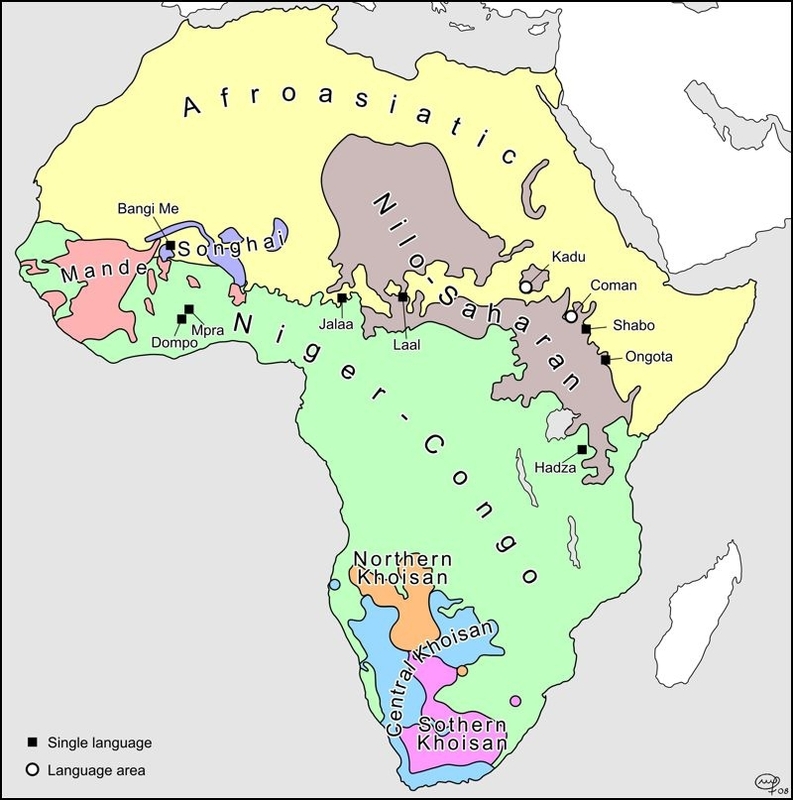 Interestingly according to some scholars the Mande language group might be seen as being distinct from the wider Niger-Congo language family. Possibly having to do with ancient origins within the Sahel region. 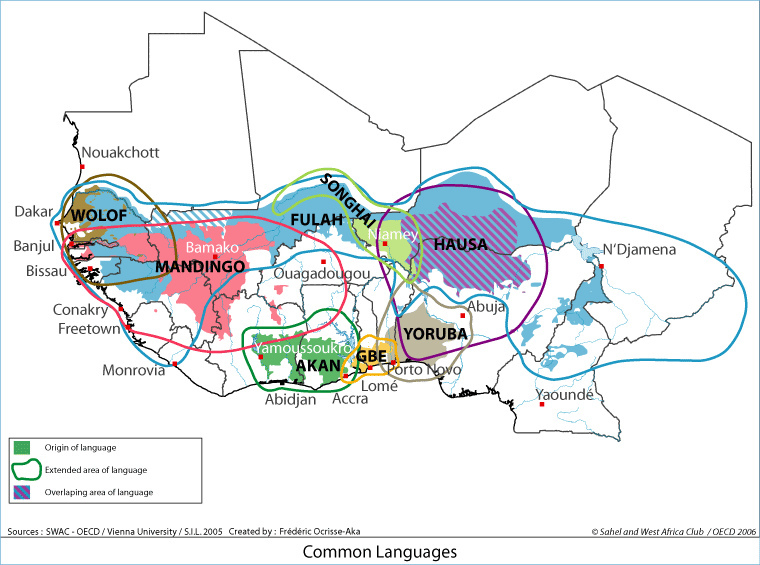 The Hausa language as spoken by native speakers (incl. many urbanized Fulani who have intermarried with the Hausa) is found chiefly in northern Nigeria and Niger, which is already a large area. However just like some of the Mande languages, Hausa has also been a very influential lingua franca, used by other peoples as a second language. 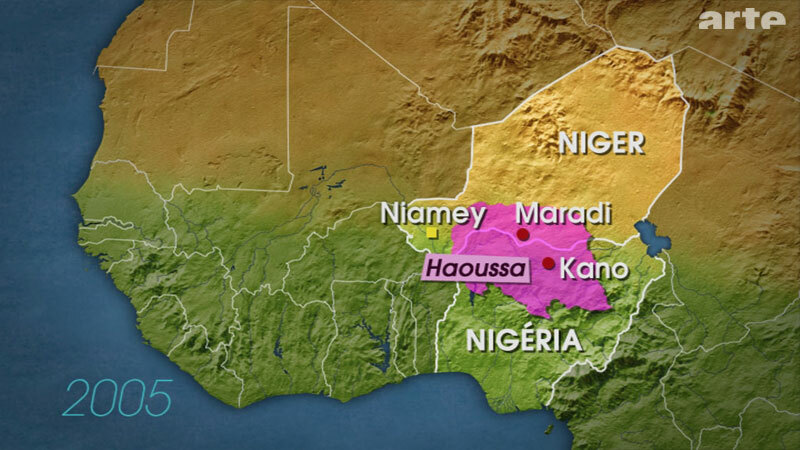 Measured in this way the Hausa language can be found all the way west to the Ivory Coast! For more information about the Hausa language visit this website: UCLA Hausa Home Page. 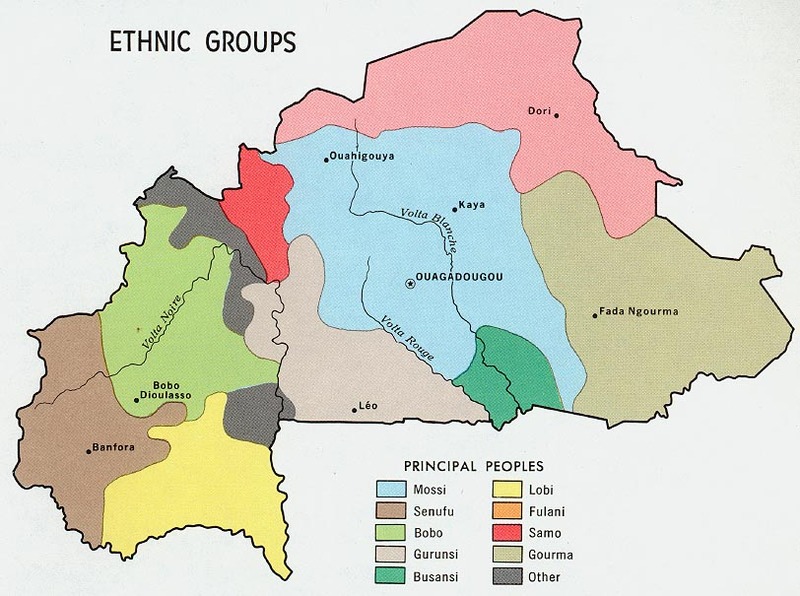 Another fascinating aspect about Hausa is that it’s a socalled Chadic language, distinct from the mostly Niger-Congo languages of Western Africa, but related to other Afro-Asiatic languages found in the northern Sahel, like Berber/Tuareg and Arab. It’s reflective of the numerous migrations criss-crossing the Sahel region and in this case suggestive of origins from ultimately Chad/Sudan. More so than the other Sahel countries Mauritania is covered to a very large extent by the Sahara desert. It’s very thinly populated therefore. With the bulk of its population residing on the northern bank of the Senegal river, a narrow landstrip surrounded by arid landscape. 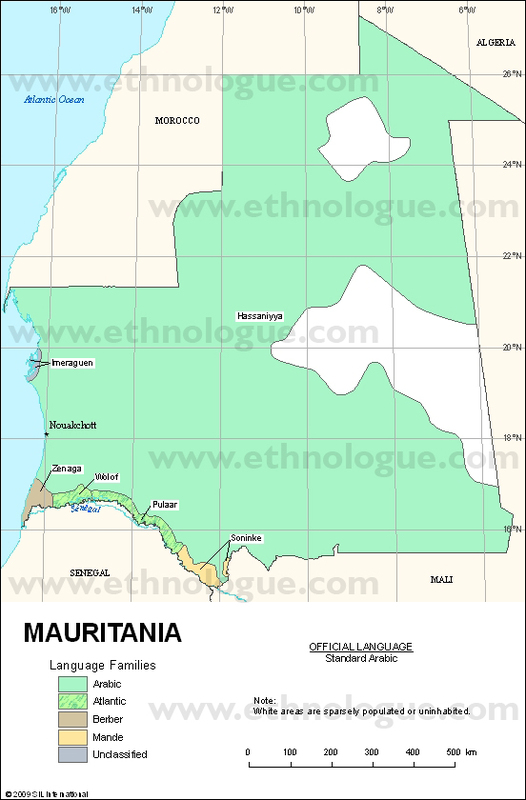 In fact the ethnic groups living in this most southern part of Mauritania, the Wolof, Fula, Soninké etc., are basically a continuation of Senegal’s own ethnic composition. Otherwise it’s mostly nomadic Berber and Arab speaking “Moors” who live in Mauritania. In a much bigger proportion than what’s average for the other Sahel countries, hereby linking it more strongly to North Africa perhaps. The presence of native Mauritanians and particularly Berber or Arab speakers among the enslaved victims of the Trans Atlantic Slave Trade is likely to have been very insignificant in numbers. Not only because of Mauritania’s small sized population but also because of the prevailing patterns of warfare and slaveraiding. 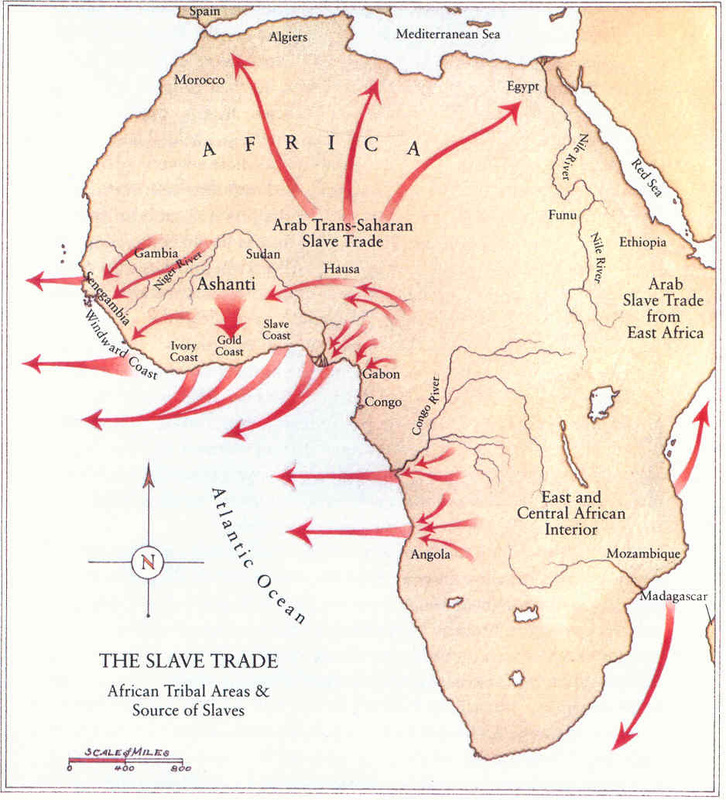 Participation in the Trans-Saharan slave trade would have been predominant, with the captives usually coming from along the Senegal river or areas to the south of it. Outside of Mauritania proper. Yet still there is scattered documentary evidence found in various slave registers that socalled “Moorish” captives were at times exported to the Americas. Arguably an ambigious term but depending on the context it could also have referred to Mauritanians. If so, no doubt they would have embarked mostly via the Senegalese slaveport of Saint Louis, established by the French. Especially in Louisiana it seems (see upcoming blogpost) but in fact also a couple of West Indian Slave Registers (Trinidad & Saint Lucia) mention a few single Moors or North Africans among 1000’s of other slaves (see this overview). Also in Brazilian slave registers for the northern state of Maranhão and in a Guiné Bissau register the term “Mouro” is being used a couple of times to refer to “Moorish” captives. An earlier involvement of Mauritania in Atlantic slavetrade occurred through the Portuguese slaveport of Arguim founded in the mid-1400’s and located on Mauritania’s own coast. It might possibly have been more influential ancestrally speaking because of a cumulative founding effect. Even when in total numbers the later Trans Atlantic Slave Trade was much bigger of course. Before the American continent was “discovered” by Columbus already large groups of captives were being exported via Arguim to Portugal and Spain as well as their Macaronesian island colonies (Cape Verde, Canaries, Madeira and Açores). It is known that the coastal Berber settlements of Mauritania have frequently been raided for slaves by first the Portuguese explorers and later on also settlers from the Madeira and Canary islands. Despite official policies encouraging a more formalized slavetrade instead this raiding might have continued till the late 1500’s. 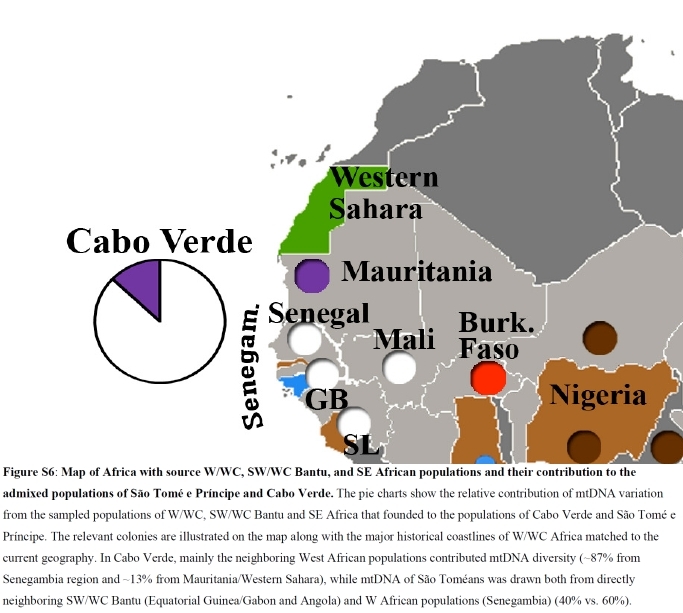 In a recent mtDNA study 10-20% of maternal haplogroups from Cape Verde were linked to Mauritania. See this figure and also this blogpost: Locating Afro-Diasporan haplogroups within Africa. From all the Sahel countries it’s most likely Mali which can be linked ancestrally to the greatest number of Afro-descendants in the Americas. Because of its relatively easy access to the slave ports in Upper Guinea and at times even the Gold Coast. This is also confirmed by historical documentation and contemporary travelling reports. 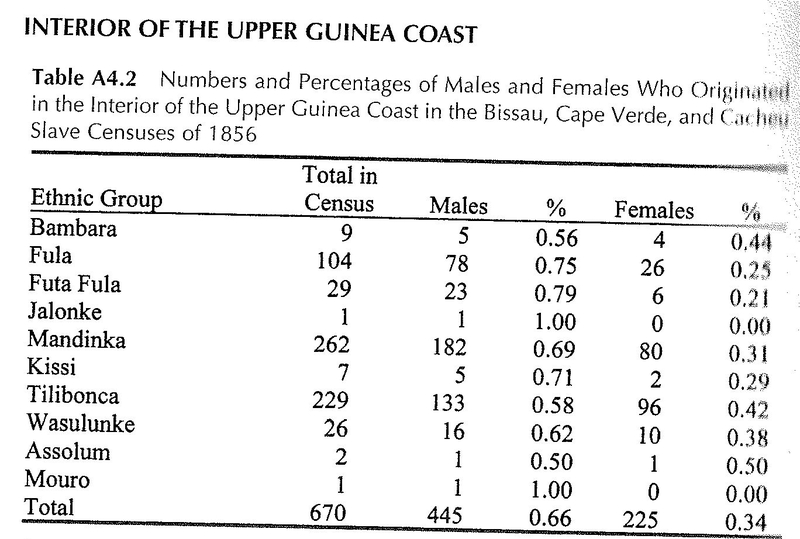 The heavily used but ambigious “Mandingo” ethnonym actually could mainly have referred to Upper Guinean Mande speakers (see Mande section above). Although also the Malinké and Soninké from westernmost Mali might have been referred to as Mandingo. 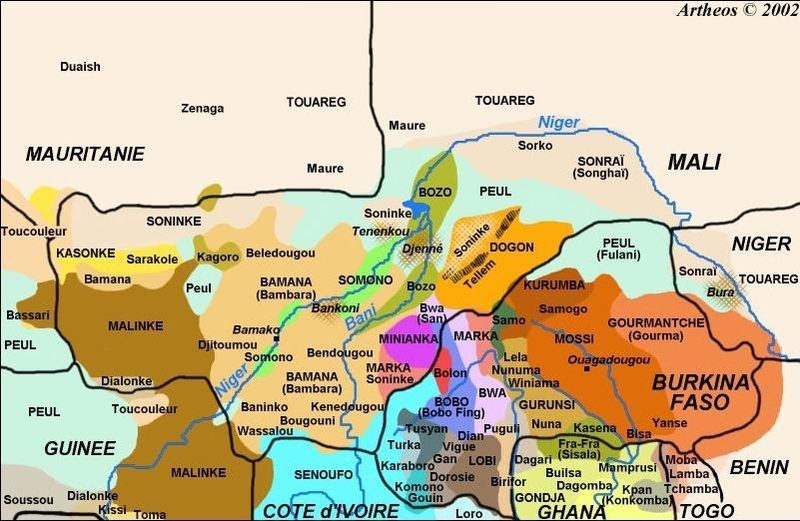 However “Bambara” was another frequently used slave ethnonym, which can be more safely connected with Mali or at least the most eastern/interior parts of Upper Guinea. Mali is of course justifiably famous for the former Mali Empire and the lasting cultural impact it made throughout the region and beyond. 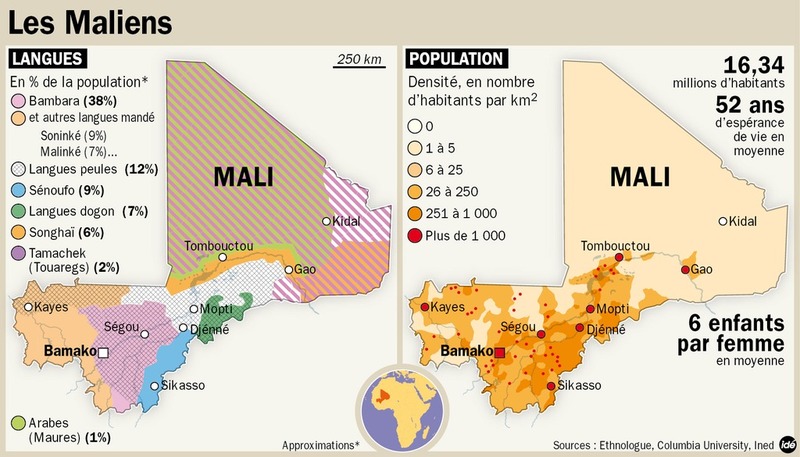 However there are also many other non-Mande speaking ethnic groups present within Mali’s borders who likewise have a fascinating background. One of them being the Dogon, who similar to the Bamana at first, resisted early islamization and kept on to their own beliefs and traditions. Another one being the Senoufo, part of the Gur speaking language group, and also found within Burkina Faso and the Ivory Coast. Aside from Mali it’s probably Burkina Faso which was affected the hardest by Trans Atlantic Slave Trade, although the Trans Saharan Slave Trade might still have been greater in volume. This country is however much less discussed as potential place of origin for the Afro-Diaspora, which is a shame really as it has very fascinating people. 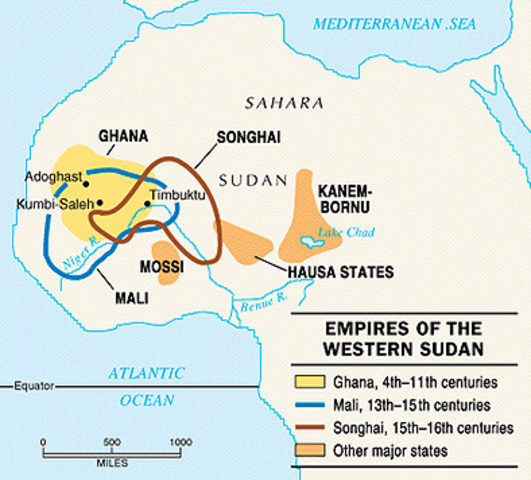 Especially the Mossi states have a long history of resisting the advance of bigger empires situated in Mali. Also in the 1800’s they put up a brave fight to maintain their traditional customs and beliefs against the onslaught of Jihadistic campaigns during that time. Captives from Burkina Faso would naturally be transported mostly via the Gold Coast and the slaveports along the Bight of Benin. It is assumed that the socalled “Chamba” would have referred chiefly to Gur speaking people to the north of the Ashanti & Dahomey empires. Chamba was a a slave ethnonym regularly used within the West Indies and also Louisiana. In this way it could also have included many Burkinabé. Although there’s still a great deal of uncertainty and in fact also other blanket terms like Coromantee, Mina, Popo and Arara might have included people from much further interior and even Burkina Faso at times. 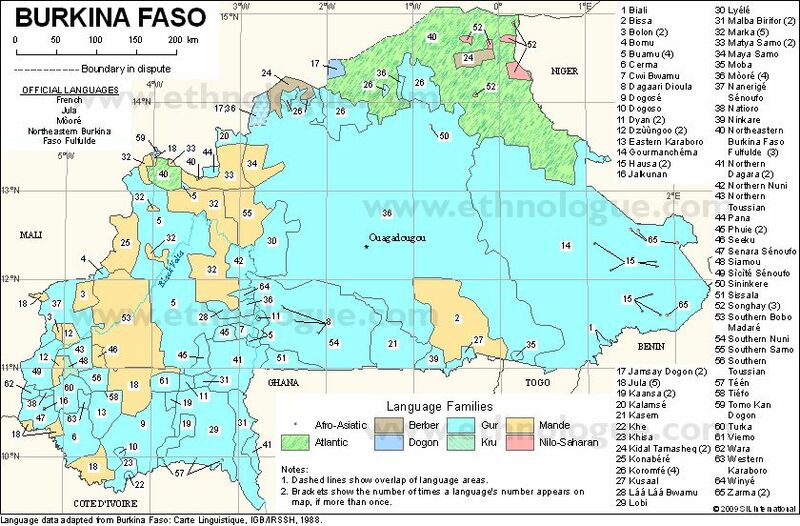 As can be seen in the maps below Burkina Faso is very much a multi-ethnic country with also many different language groups being spoken by its minorities. Still it’s the Gur speaking majority and especially the Mossi, who might be most representative for the country. Both Niger and Chad might have been the least affected by Trans Atlantic Slave Trade, not surprisingly perhaps given the longer distances to the coast. According to some estimates it would have been very marginal indeed (below 1000 captives in total) especially compared with their much greater involvement in the Trans Saharan Slave Trade (Nunn, 2008, p.152, link to online article). But there’s no way to verify these estimates yet, except perhaps future DNA testing. As already discussed above Niger shares its Hausa majority (more than half of the total population) with northern Nigeria. The Hausa are actually a well documented slave ethnicity in the Americas, especially those colonies with heavy importations from the Bight of Benin and particularly during the late 1700’s and early 1800’s. 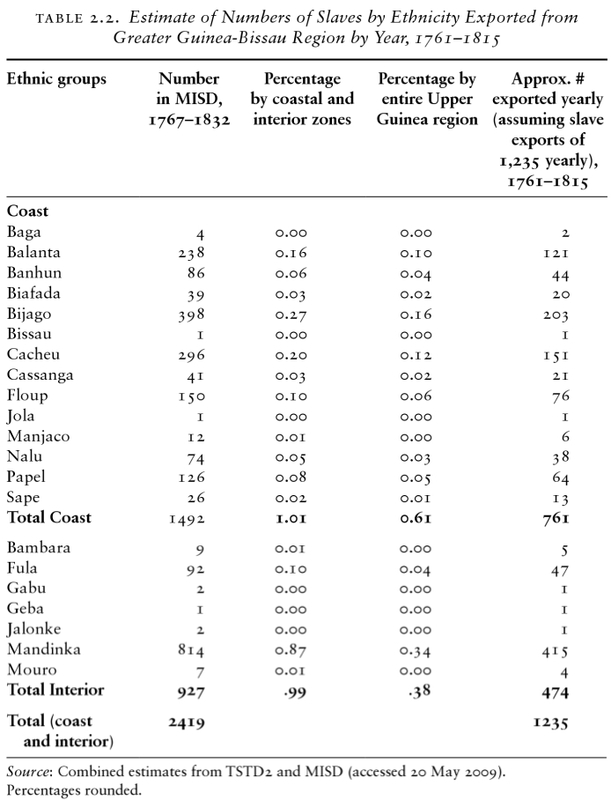 Bahia in Brazil might have received the most of them given the known Hausa involvement in its famous Muslim led slave rebellion of 1835 (Male Revolt). 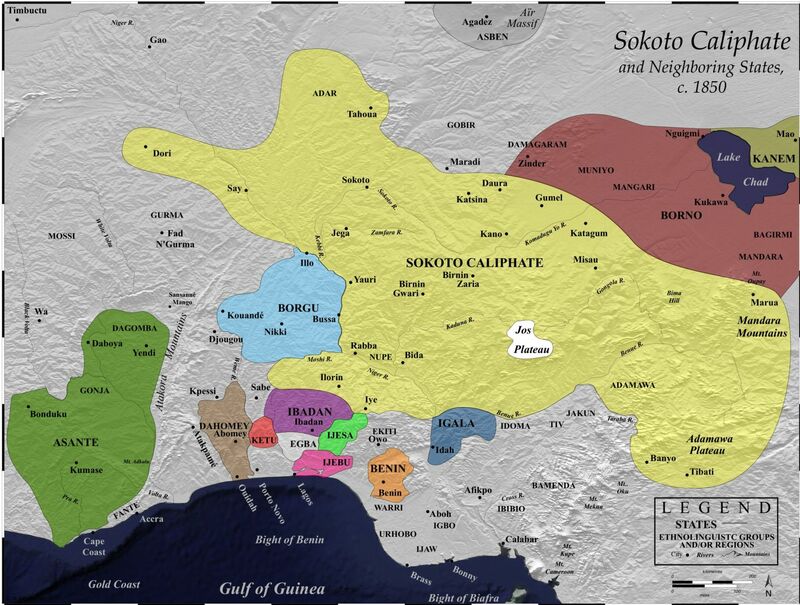 They were mostly warcaptives resulting from the emergence of the powerful Sokoto Caliphate (see also map above in Sudanic Empires section). 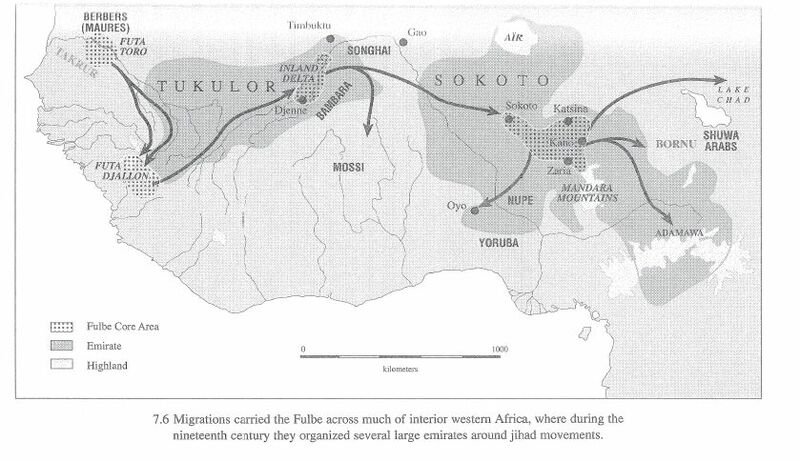 It’s doubtful many Hausa’s would have ended up in the Americas during earlier timeperiods (1600’s/1700’s). Either way it’s impossible (and a bit irrelevant) to establish if these Hausa captives were from either modernday Nigeria or Niger. I’m personally not aware of any other ethnic groups from Niger being documented within the Americas, except 1 Songhay Recaptive who was intercepted and brought to Sierra Leone in the 1800’s to be interviewed by the linguist Koelle (see the Bight of Benin map at the end of this blogpost : Krio from Sierra Leone: Afro-diasporeans with a twist?). Again this concerns a rather late mentioning and it’s not likely many other Songhay captives were shipped to the Americas. 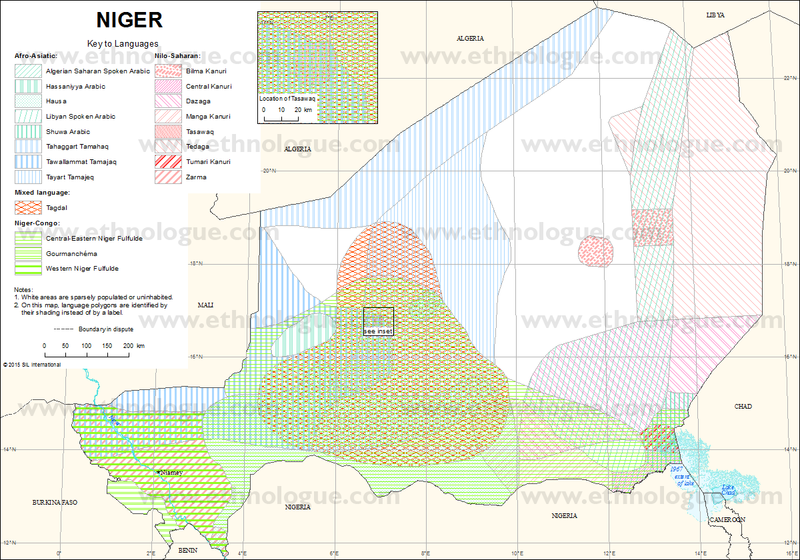 Still it’s interesting to know that the socalled Zarma Songhay or also Djerma are the second biggest ethnic group of Niger and their Songhay language group (spoken also in Timbuktu!) 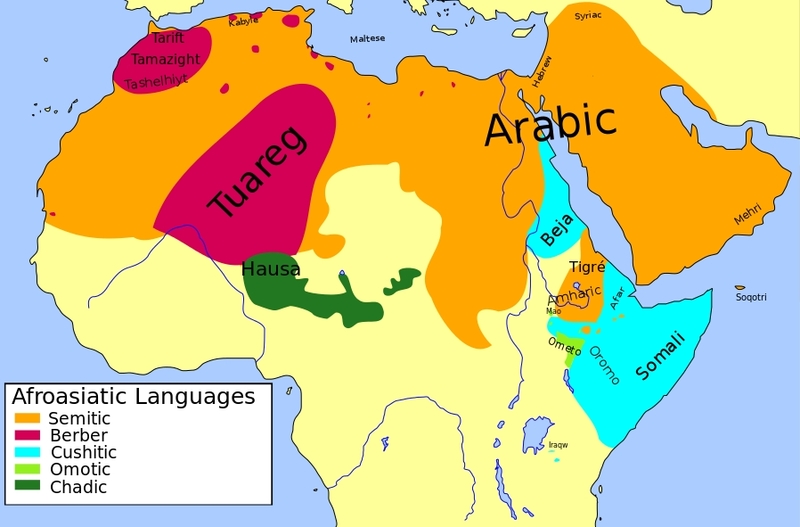 is rather unique for possibly being a remnant of a once much wider distribution of Nilo-Saharan languages in the Sahel region. 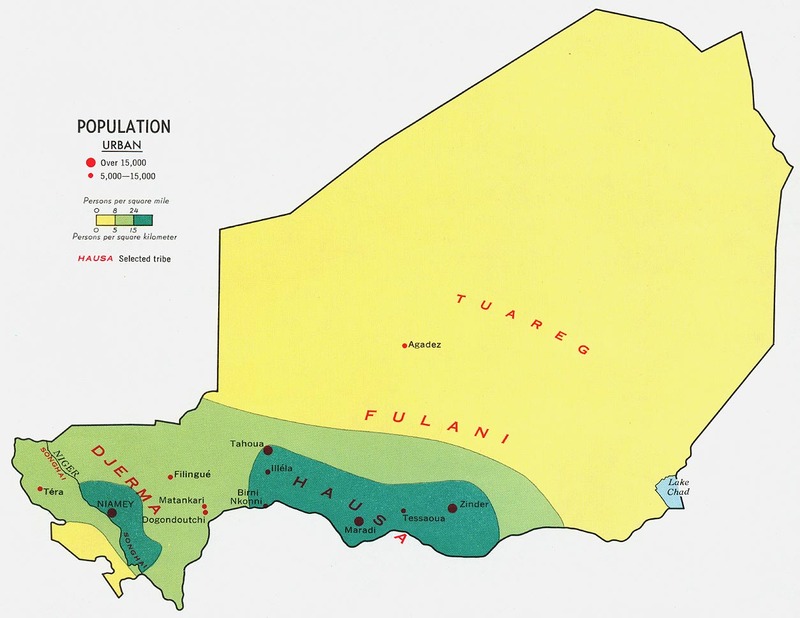 In many ways (geography, ethnic composition and history) Chad can be seen as West Africa’s gateway to Northeast Africa. Historically speaking it developed very close trading and cultural relationships mostly with Libya, Egypt and Sudan. Sadly this also included a very brisk Trans Saharan Slave Trade. Carried out especially by the longlived Bornu Empire, centered in currentday northeastern Nigeria but also covering much of Chadian territory surrounding Lake Chad. 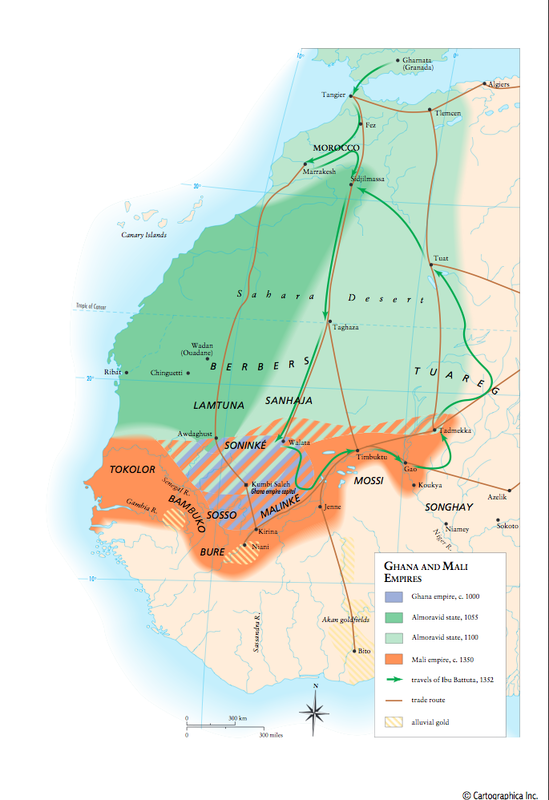 Most enslavement at that time might have occurred among non-Muslim and Nilo-Saharan speaking ethnic groups living in southern Chad, like the Sara. Because the Bornu Empire relied so much on its profitable overland trade to Libya and Egypt it’s unlikely that a noticeable number of these captives would have ended up in the Trans Atlantic circuit instead. I’m personally not aware of any documented connections with the Bight of Biafra for what it’s worth. However in the early 1800’s the ancient Bornu Empire itself fell victim to the more vigorous Fula led Sokoto Caliphate. The widespread warfare at that time and the Hausa trading routes inbetween northern Nigeria with Benin resulted in a stream of Kanuri captives being sold on the Bight of Benin coasts. A very welldocumented case being the Recaptive Ali Eisami, born near Bornu in presentday northeastern Nigeria (see also this article). He was a Kanuri speaker who ended up in Sierra Leone where he was interviewed by linguist Koelle. Arguably this concerns a people living on the very edge of presentday Chad and also given the late timing it might only be relevant for destinations in the Americas heavily involved in the illegal slave trade of the 1800’s (Brazil and Cuba mostly). Still also Recaptives belonging to other Chadian ethnic groups were interviewed by Koelle as can be seen in the very last map of this page. – Curtin, P. (1968). Africa Remembered: Narratives by West Africans from the era of the Slave Trade. – Hall, G. (2005). African Ethnicities in the Americas: restoring the Links. Do you know if any Gur speaking people have taken the ancestry test? I am curious to know if they would be closer to Mali or Ghana. If they have self identified as Burkinabe or Dagomba, Mamprusi or Nanumba. Any more Gur speakers now?